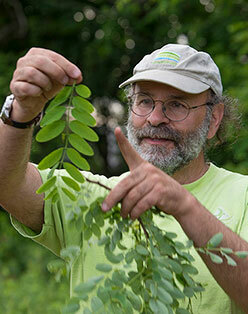 CANCELLED Naturalist Russ Cohen will give a presentation on foraging for wild plants and mushrooms. The area in and around Newport County is home to over 100 species of edible wild plants. Many of these species are more nutritious and/or flavorful than their cultivated counterparts. These include native species like Black Raspberry and Butternut, non-native weeds like Burdock and Chicory, and exotic invasive species like Dame’s Rocket and Japanese Knotweed. The region is also home to dozens of species of edible mushrooms. Join Russ Cohen, wild edibles enthusiast and author of the book Wild Plants I Have Known…and Eaten, for a 90-minute slide presentation featuring over three dozen of the tastiest species the region has to offer. These include species everyone knows well, like Daisies and Dandelions, plus species they may never have even heard of, like Calamus and Carrion Flower. At least a dozen of the easier-to-recognize edible mushrooms will be covered too, from Morels in the spring, to Black Trumpets in the summer, to Hen-of-the-Woods mushrooms in the fall. Keys to the identification of each species will be provided, along with info on edible portion(s), season(s) of availability and preparation methods, as well as guidelines for safe and environmentally responsible foraging. Russ will also include a few details regarding some native edible plants he has grown successfully from seed, and the partnerships he has made with conservation groups and others to add edible native plants to their landscapes. Last but not least, Russ will accompany his talk with handouts and a foraged goodie or two made with wild ingredients. Free and open to the public. Registration requested. Russ Cohen, naturalist and wild foods enthusiast, grew up in Weston, Mass. (where his mother still resides), where he spent much of his free time in the woods, thereby cultivating a strong spiritual connection to nature. Russ' first formal exposure to edible wild plants occurred while a sophomore at Weston High School, where he enrolled in an "Edible Botany" mini-course offered by the high school biology department. He learned about two dozen edible species that grew around the high school grounds, and the class had a big "feed" at the end of the course. Russ got turned on to the subject, went to the local library and took out every book he could find on the topic, taught himself over fifty more species, and, in his senior year of high school (1974), he taught the Edible Botany class he had taken as a sophomore. Russ added edible wild mushrooms to his teaching repertoire in 1989 after returning home from a trip to the Soviet Union, where he caught the mushroom hunting bug from the Russians. Russ currently resides in Arlington, Mass. He received his bachelor's degree in land use planning from Vassar College in 1978, and received a masters in Natural Resources and a law degree from The Ohio State University in 1982. Until retiring from state service, Russ was employed by the Riverways Program (now part of the Division of Ecological Restoration) of the Mass. Department of Fish and Game since 1988, and served as its Rivers Advocate from 1992 until June of 2015. Other past employers have included the Nature Conservancy, the Land Trust Alliance, The Hillside Trust, a land trust in Cincinnati, Ohio, and the Massachusetts Audubon Society.